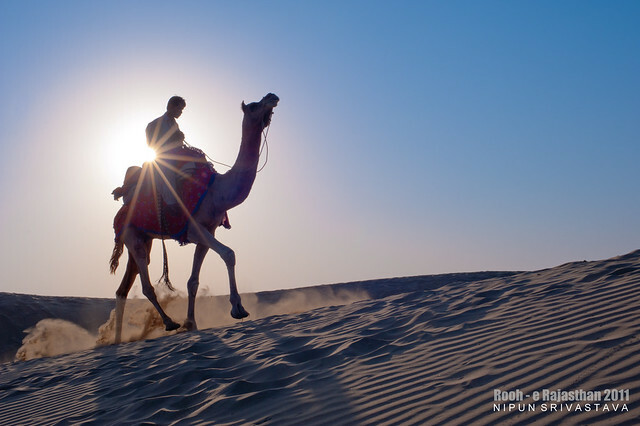 Rajasthan, the land of sand and more. From Jaisalmer to Jaipur, this vast state titillates the imagination with visions of loitering camels, boundless sand dunes and august forts. To say that it was a dream to ride across these sands and experience what this land has to offer would be an understatement. Two years had passed in the run up to this monumental and personal undertaking. Finally though, we did it. Over the twenty eight days which I spent on the road with my trusty motorcycle, we covered over four thousand kilometers. I met more people than one would ever imagine and experienced more than I ever thought possible. The alluring scent of the scenes here is made up of so many aromas and vistas that it is next to impossible to try and put in words its brilliance. A motorcycle man head out alone into Rajasthan to repaint the canvas of his memories from early childhood as the son of an Army Officer. Roads were ridden and sights were seen, people were met and food was eaten. With every rise of the sun came new milestones and bastions which gave way to brilliant frames and the setting sun. Each night was a realization of a new human being taking shape inside. Each moment was a revelation to the eyes of my time on this land. This is a journey of two characters. 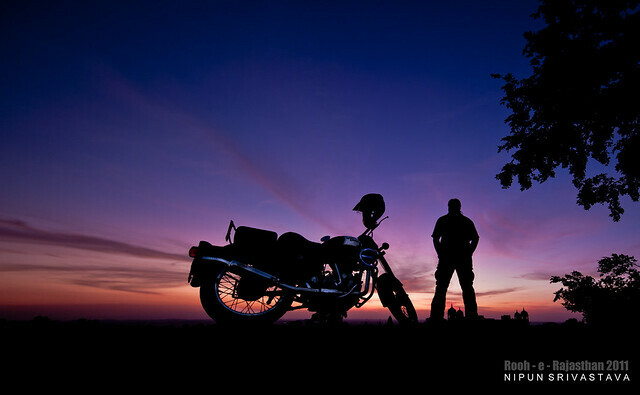 The man – Me and his Motorcycle – The Marauder. Every day they travelled and did what tourists would do in a new town. This will be a glimpse of their story over those twenty eight days. Not only will you witness the pleasure of being on the road but you will also view the emotions that drive a person. On good days or bad, the need for self motivation is a constant on such endeavours, out on a solo trip, it takes more than just the will to leave home. Over the coming weeks, you will be enthralled with content from this motorcycle ride across Rajasthan. One by one, the destinations and their sociology will compel you to get out of your chair and head out on your own. Once this was a thought, today it is reality. Ladies and gentlemen, I bring to you Rooh – E – Rajasthan 2011. Treat yourselves to the poster shots from this mammoth trip: Click here. The trip has started! Go ahead and read! Part two: Rajasthan. The western sector. Part three: Marwar – Central Rajasthan. Part four: In the hills of Rajasthan. Part five: Rajasthan – The Capital City. Part six: Tales from beyond the sands of time – Chittaurgarh. Rooh – E – Rajasthan, the film. A film by travel photographer Nipun Srivastava about his 5000 kilometer solo motorcycle journey across the desert state of Rajasthan in India. Nipun set out to shoot the cities in Rajasthan with his cameras and ended up with one of his favorite pieces of written/photographic work. With the lack of decent video and audio equipment, Nipun set about shooting his experiences in video with only time lapse footage and shots taken with his cell phone and DSLRs. This entry was posted on December 24, 2011 by Nipun Srivastava. It was filed under Motorcycle Trips and was tagged with biking, bullet, cliche, holiday, india, motorcycle, people, photography, riding, rise, road, royal enfield, sand, sky, sun, tourism, tourist, Travel, traveller. Hello, Thanks for sharing such a fantastic blog.I really appreciate your blog to share information about places to visit in Rajasthan…Visiting in Rajasthan is amazing experience. This is amazing place with historical monuments and rich traditional culture….I like your article very much….Virasat Restaurant is a famous place to visit in Jaipur where you get royal experience by live music, folk dance, Rajasthanithali, Ganlanding,Royal Welcome, feet Wash.